Judaism is a 4000 year old religious heritage that developed the first functioning alphabet, and with it wrote the foundational Scriptures of Western Civilization. From its earliest conception as a simple Patriarchy, to its priestly Jerusalem-based sacrificial ritual, to our modern synagogue-centered religious community-- it has evolved and expanded its theology such that it is presently practiced by a broad Jewish spectrum that includes both insular fundamental and modern acculturated Jewish communities. At its heart, Judaism proclaims that God’s purpose for Humanity is to be God’s partner in Creation, to transform God’s good world into a better world, that our responsibility is to strengthen what is frail and repair what is broken in our community by living lives of justice, righteousness and loving kindness. Thus Judaism is often described as a religion of deed over creed, that what God wants from us is proper behavior, even more than proper belief. Therefore for Jews, religious terms like Salvation and Redemption always refer to the condition of the world, rather than one’s personal condition or being. Historically, the Judaism described in Hebrew Scriptures ended with the Roman destruction of Judea and Jerusalem in the year 70 CE. Biblical Judaism gave way to the great developmental revolution of the rabbis in the late 1st C that would transform Biblical/priestly/sacrificial/Jerusalem centered Judaism into a scholarly/synagogue/ rabbinic/universal Judaism that could adapt itself to ever-changing social and cultural environments. No longer defined by the ‘where’ of Jerusalem, and the ‘who’ of the priests, and the ‘what’ of offered sacrifices, Judaism would flourish wherever Jews chose or were forced to live. Thus the covenant God declares to Abraham in Genesis, and establishes with his descendants, is re-affirmed with every generation since, despite the changing existential conditions that have confronted Jewish communities throughout its 4000 year history. 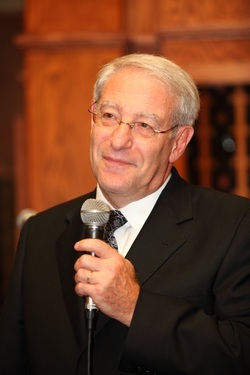 Rabbi Joe Klein was ordained in 1975 from the Cincinnati campus of Hebrew Union College-Jewish Institute of Religion with a Masters of Hebrew Letters, and served as the rabbi of congregations in Terre Haute IN and Chattanooga TN, becoming Senior Rabbi of Temple Emanu-El (Oak Park MI) in 1997 until he retired as Rabbi Emeritus of Temple Emanu-El in 2013. Since the Fall of 2015 Rabbi Klein is the Visiting Rabbi of the Grosse Pointe Jewish Council. He is currently Adjunct Faculty in the Religious Studies programs of Oakland University and Rochester College, and teaches October - May in the Metro-Detroit Jewish Federation’s Adult Education program. While in Indiana and Tennessee he was Adjunct Faculty in Humanities at Rose-Hulman Institute of Technology, Indiana State University and the University of Tennessee at Chattanooga.